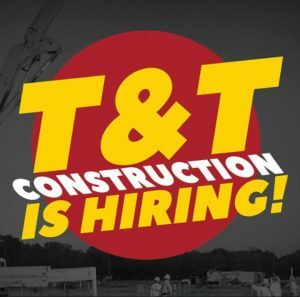 Are Construction Jobs Available with T&T? Construction runs in your blood, you don’t mind a little dirt and you’re ready to put in a hard day’s work. Just one question remains: Is T&T hiring? Our crew is proud to say we stay pretty busy, and we are always looking for qualified team members to join us on our construction jobs. How does the job inquiry process work? There are a few ways you can go about it, and they’re all pretty simple. The first option — and the one we personally recommend — is to visit the Employment page right here on our website. Not only will you find the basic qualifications required for positions such as superintendent, heavy equipment operator, project manager and foreman, but you can submit your information directly to the company. Our fill form makes applying easy and speeds the entire process along. For urgent employment needs, such big projects that require extra manpower, we take to social media. It makes sense, considering so many of our construction colleagues visit the sites regularly anyway. Those social media posts include a general rundown of the position we’re looking to fill, as well as who to contact for additional information. Want to stay clued in? Friend us on Facebook and connect with us on LinkedIn! One thing to remember, however? Commenting on our social media posts does not constitute an official application. You’ll still need to follow traditional protocol if you’re interested in working with us. Finally, you are always welcome to reach out directly to inquire about available positions. You can call 713.477.6660, email info@tandtconstruction.com or get in touch through the form on our Contact page. Whichever way you choose to keep tabs on T&T Construction openings, we appreciate your interest in our company. We think this is a pretty great place to work and, according to the Houston Business Journal, our employees do, too! We look forward to hearing from you!